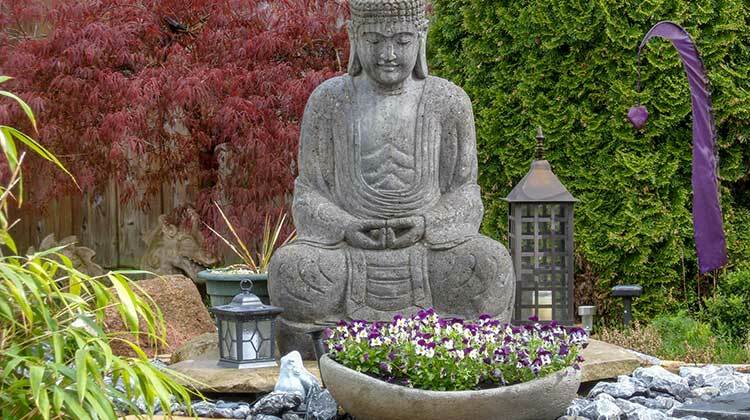 Creating a meditation garden can be a delightful addition to your spiritual practice, both in the gardening itself and by just being in a garden. And it doesn’t have to be difficult or time consuming. I live in the suburbs in a very small apartment. But I’m fortunate to have a fenced patio and a small amount of earth. I grow herbs and a rose in pots on the patio, and vegetables and flowers in raised beds in the space between the patio and fence. It brings me joy and working in the garden is healthy and balances my too many hours on the computer. My garden is a special space where I enjoy the beauty of flowers and feel the relaxing energy of nature even in the busy urban environment. Select lush plants. An abundance of green plants helps to create a relaxing atmosphere. Any variety of mint or other herbs will add a pleasing scent. If you live in a warm climate, you can enjoy the rustle of bamboo or look for an ornamental grass that’s suited to your region. Incorporate inspiring objects. Depending on your faith tradition, you may want to include a statue or another meaningful image. A simple arrangement of rocks or weathered wood can add extra appeal. Many people also find it helpful to rake gravel or sand. Many specialty stores sell these ready made “Zen” Gardens. Install a fountain. The sound of running water is relaxing and masks background noises. Running water also gives off healing negative icons. And you can meditate on the properties of water to bring more flow into your life. Arrange for comfortable seating. If you prefer to sit on the ground, you may just want to keep a spot clear so you can bring a cushion or mat outdoors with you. If you use a chair, ensure it promotes good posture so you can keep your back straight and your feet on the ground. Build a path. Even in a small garden, a path can enhance your sense of space and exploration. You can contemplate a trail of stones or diversify your practice with some walking meditation. Clear away distractions. Put aside internal and external distractions when it’s time to meditate. Depending on where you live, it may be helpful to meditate early in the morning when there’s less traffic and other background noise. Make distractions part of your practice. If external distractions persist, welcome them into your practice. Use the sounds of car horns and people talking to train your mind to stay focused on your meditation object instead of pursuing other thoughts. Note the interruption and bring your mind back to your contemplations. Ward away bugs. There are many ways to steer clear of insects without killing them. For wasps, keep a look out so you can stay away from their nests. Avoid the things that attract them like perfume, bright colors, and food. For natural ant repellent, try planting some mint or cucumber. Gardening can be a great way to bring meditation into activity. When you’re working in the garden—planting, pulling weeds, harvesting, etc. — do it with the same focus and concentration you bring to sitting meditation. Don’t indulge in thoughts—either rewriting the past or planning the future. Just for this time, be present in the Now. I find it helpful to observe my arms and hands moving, doing the tasks. Try to feel the energy behind the muscles moving your hands. This mindful practice in activity will carry over into still meditation and make it easier and more enjoyable. In this modern age, most of us spend way too much time connected to technology—computers, phones, TV. These devices immerse us in a unnatural energy that interferes with our own body’s energy and rhythms. This causes a lot of stress as the body tries to compensate and maintain its natural balance and energy production. Spending time in nature will relieve stress, energize our bodies and calm our minds. I’m sure you’ve all felt the difference of being by the ocean, or walking in a forest. But if you live in the city or suburbs like I do, you may find it inconvenient to spend much time there. Your own garden to the rescue. Even just looking away from the computer out the window at my garden, relieves my stress, calms my mind, and makes me happier. Do you have a garden or want one?